You might think that such a small creature as the hamster does not need much. Yet this living being requires more than just a cage, food and occasional attention. Before going out to purchase or adopt a hamster, make sure you have all of the items he will need on hand. There are various types of cages, each with their own benefits. A plain wire cage with a flat bottom allows a constant circulation of air. To prevent escape, the bars of this cage must be spaced no more than 1/2 inch apart. Some wire cages come equipped with colorful tubes for your hamster to tunnel in. However, not only can these be too small for your hamster to live in, they cause difficulty when trying to bond with your hamster or clean the cage. A 10-gallon glass tank with a screened lid is another option, especially if you have more than one hamster, offering an easy way to interact with your hamster without fearing that he will escape. If possible and safe, use the same type of bedding to which the hamster is already accustomed. Otherwise, look for absorbent aspen, hardwood shavings or wood pulp bedding. Never use cedar or pine bedding, which can make your hamster sick. Incorporate a few tissues or paper towels that your hamster will shred up to make into nesting material. Remember that you'll need to dump the bedding to clean the cage on a weekly basis with soap and hot water, never bleach. Provide your hamster with fresh food mix daily, comprised of pellets, seeds, cracked corn and grains. Use a heavy ceramic or stoneware dish that cannot be turned over easily, rather than a plastic dish that he can chew apart. You can give small bits of fruits and vegetables daily, such as carrots and apples, but feel free to experiment with different types to discover what your individual hamster prefers. Remove what he does not eat before it spoils. Sunflower seeds and toasted oat cereal are used for treats, and you may notice your hamster storing them in his cheeks for later. Provide clean, fresh water daily in an inverted water bottle. 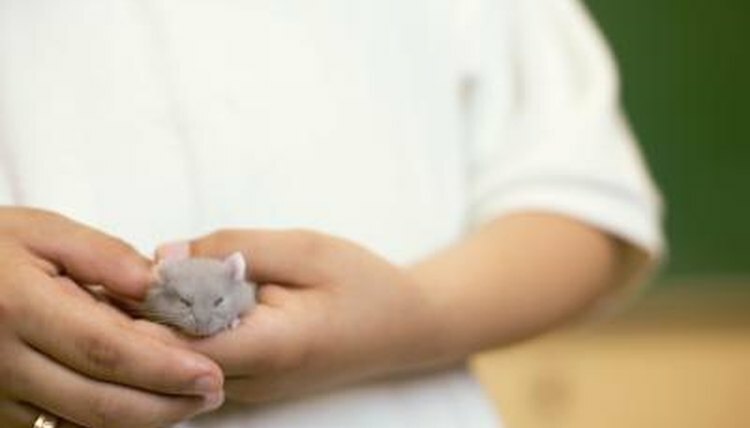 Your hamster will need exercise and mental stimulation. A running wheel needs a solid floor to prevent any foot injuries. Also purchase a hamster ball so he can run around while you clean his cage; have another person supervise him during this time. Chewing toys are essential for the hamster to file down his continuously growing teeth. Use untreated wood blocks or venture into the bird section of pet supply stores to get a wooden ladder. Cardboard is an excellent chew toy, which you can obtain at no cost to you. Recycle toilet paper tubes, paper towel tubes and cereal boxes for your hamster to play with and chew. Finally, as you will likely not be with the hamster all day every day, make sure he has a friend. The hamsters should be the same gender to prevent breeding, and preferably from the same litter so that they are already acquainted with each other.